Temporarily change your display mode. Enable this setting and simply knock on the top of your device twice to access the secondary display. For example, if you are on clock mode and you knock on the device, it will temporarily show the Awair score for 10 seconds before reverting back to display the time. Activate sleep mode to ensure random knocking around the house doesn’t cause drastic changes in your LED lighting that would disrupt your sleep. Start knocking today and enjoy the secondary display! Choose how Awair betters your air. Based on your preferences we will recommend products that could improve your environment. We give you a choice between the 4 modes outlined below. General: Ensure your overall conditions stay fair and comfortable. Breathe easy! Sleep: Closely monitor the Carbon Dioxide and humidity levels in your air to make sure they don’t get too high. Productivity: Keeps check on Carbon Dioxide levels and humidity to stay happy and healthy throughout the day. 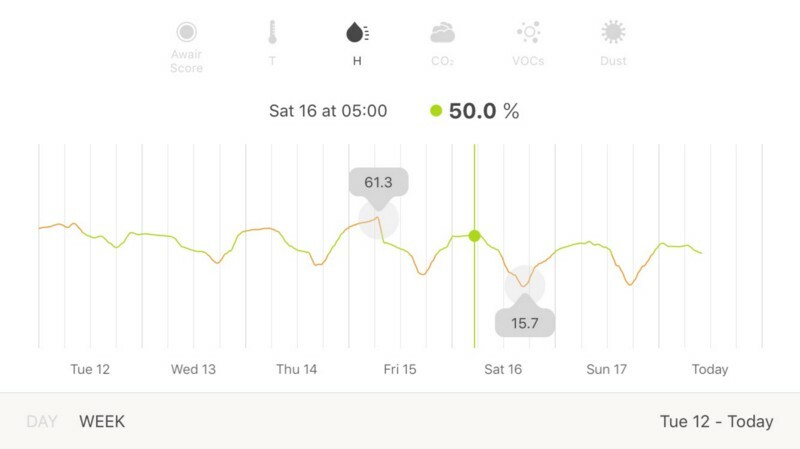 Allergies: Tracks humidity & dust levels and VOCs in your air to avoid feeling stuffy. We’re always looking to make our product better so if you’d like to partner with us and be featured on our app let us know! Don’t want the brightness of your Awair device to bother you at night? Simply go to your LED brightness setting and set your device to be in sleep mode. Your Awair will dim in accordance with the lights in your room. See your Awair data right from your homepage. Pull down your notifications tab from the top of your phone and select “Today”. 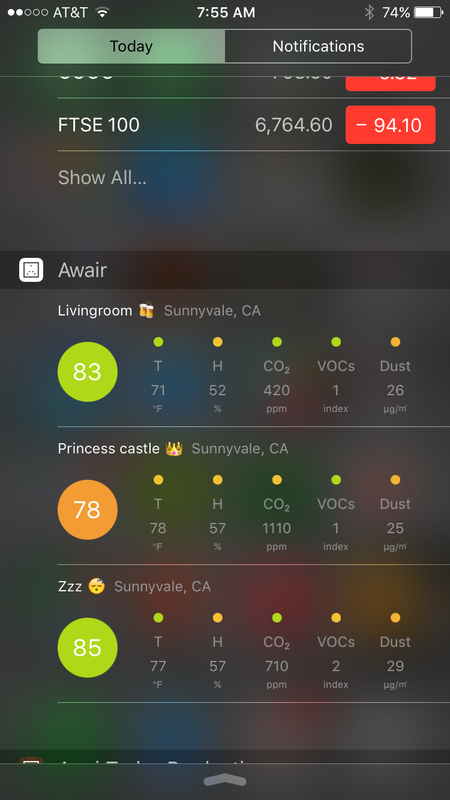 Install the widget and keep track of your air right in that drop-down menu! The Awair device is optimized to display information in a way that is simple and easy to understand. 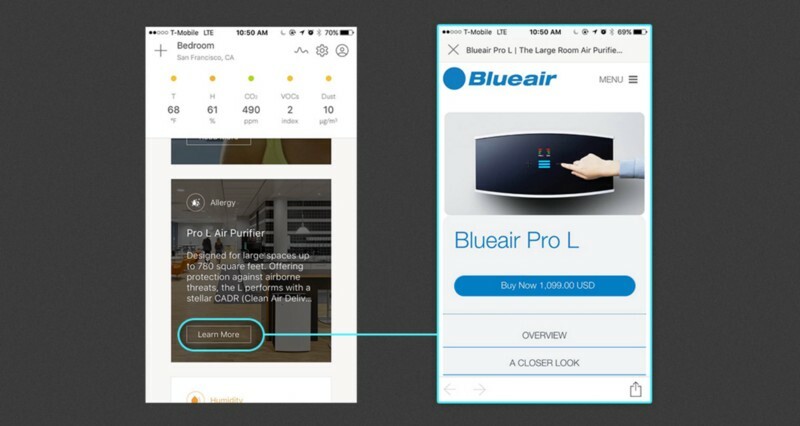 Only a small colored dot is shown on your Awair device to indicate the status of your air. This display has limited brightness to avoid disrupting you at night. 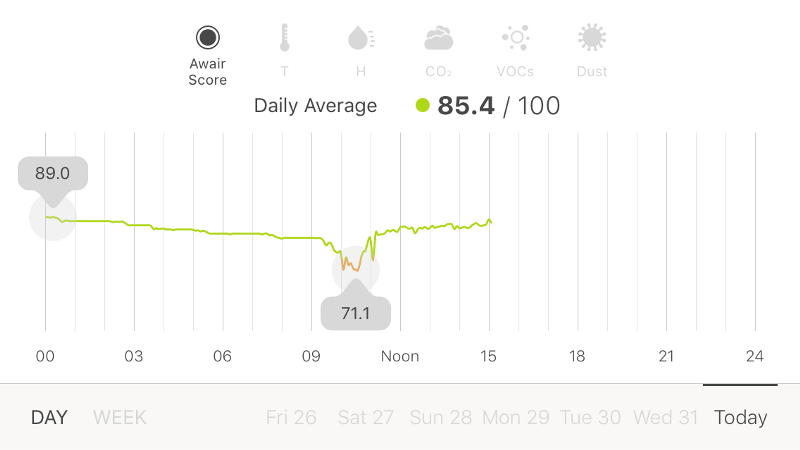 The Awair score stays visible at all times so that you can instantly see how your air is doing. Set your timezone on your Awair device and have it function as a fashionable clock. Tilt your phone horizontally and view your data in a landscape format. This timeline view makes it easier to see what’s happening in your air over a long period of time.